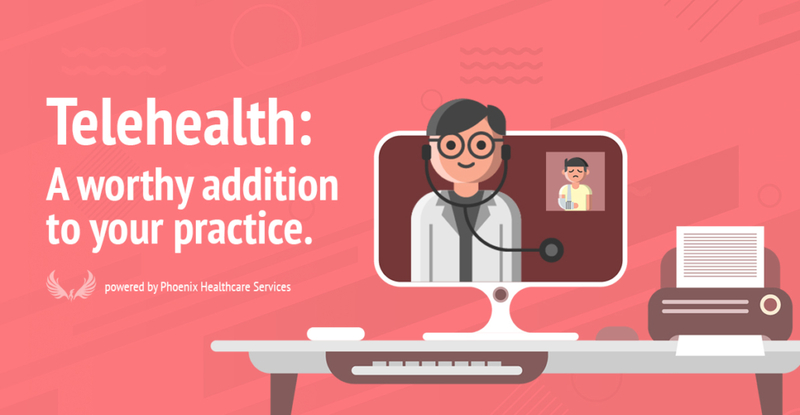 Telehealth (sometimes referred to as Telemedicine) is a combination of the ways in which a patient can connect with a physician outside of their office (most often via the internet). The technology has enabled physicians and their practices to communicate with patients through video chat, text messaging, and email automation. It has grown in popularity and state laws across the country are supporting more and more physicians in this technological movement. Telemedicine, which means: “healing from a distance,” can be traced back as far as the 1800s. Modern forms of telehealth surfaced in the 1960s and 1970s through military and space enterprises. And on December 21, 2017 – telehealth policies were approved by 34 state legislatures, according to the Center for Connected Health Policy. With an increase in American health insurance coverage, as well as changes in patient-centered care, the need for physicians to be accessible outside of the office is greater than ever. Live, two-way communication between a patient or caregiver and a provider through a computer or mobile device. This type of service serves as a substitute for an in-person meeting when it’s not available. Live video can be used for consultations, treatment, emergency, and diagnostic services. Remote patient monitoring helps providers track healthcare data for patients once released to home care. RPM has been shown to help individuals stay healthy in their home and community, without having to commute to a providers’ office. Pre-recorded videos by patients, that are then sent to a practitioner (often a specialist), who uses the information to evaluate their case and render care outside of live interactions. It’s a viable option for when there are limited board-certified specialists available. How Can Telehealth Benefit Your Practice? Many Americans, unfortunately, have expensive health insurance plans, and in some cases, can benefit from using telehealth technology. For instance, an emergency room visit can cost someone hundreds of dollars, while a telehealth visit can cost as little as $40. When you and your staff are unreachable (due to weekends or after hours calls), patients can choose to communicate with a designated on-call doctor — possibly saving them a trip to the ER. Healthcare consumers all share a common need; convenience. What could possibly be more convenient than a visit to your doctor without having to leave the house? An organization that offers telehealth undoubtedly has a huge advantage over their competitors. The colossal tech entity, Salesforce wrote a report called “The State of the Connected Patient 2015,” detailing the significant shift in how patients communicate with their providers — particularly younger patients. According to the report, 60 percent of Millenials prefers to eliminate in-person health visits, and 71 percent said they’d like to see more providers use an app to book appointments, share health data, and manage preventive care. There are countless small practices in busy cities and rural areas that are overbooked and stretched thin. Telehealth video consultations can save both the provider and the patient time and money. Between the reduction of primary care physicians and a growing demand for basic healthcare, it only makes sense for organizations to adopt new lines of patient communication to help bridge the gap and maintain a healthy bottom line. There are a significant number of reasons to consider adding telehealth technologies to your list of services. Truth-be-told, the main obstacles are often intimidation and uncertainty. New technologies have a tendency to do this to people of all walks and professions. But if your practice is to survive the test of time, it will need to be open to ever-evolving technological advances and modern milestones. Soon, all 50 US states will be behind Telehealth [Telemedicine], and the transition is more simple than you might think. We suggest you do your own research. Weigh all the pros and cons, and if telehealth is something that interests you, then we’d love to help you make sense of it all by speaking with one of our Telehealth Experts.